A Noah Bell is a type of Indian bell, traditionally sold by monasteries as a way of generating income. When using them for music composition purposes, it’s usually necessary to assemble differing-sized bells into a set so that together they form a musical scale, and that’s what Soundiron have done to create this virtual instrument. Twenty-one bells were used in total, and these were recorded with close and far mic arrays in St Paul’s church, San Francisco. As one would expect, multiple velocity hits and round-robin variations were captured, altogether resulting in 1733 samples and a 3GB installation file. Although the instrument offers user access to its raw 24-bit/48kHz WAV files (not all libraries allow this), it also provides an impressive set of Kontakt interfaces, each of which includes a great many sound-shaping tools. Largest of all the interfaces is the 1 Noah Bells.NKI, which comprises Mallet, Brush, Finger and Slap articulations, as selected via a patch of keyswitches. Some of the other interfaces focus on just one of the bell-striking methods and are smaller files. There are also a number of special-effect interfaces with memorable names like Space Aquarium and VHS Hall. Instead of having a mixer panel for balancing the various mic sources, the interface offers Close and Far pop-up panels, each with Swell, Attack, Release, Tighten, Tune and Vibrate controls, and Key Range and Key Switch settings. A third panel, called Sub, offers a similar set of parameters for controlling the synth waveform that is present under the main bell tone. Layering synth tones for reinforcement is a trick almost every modern producer uses, so it’s great to have a dedicated tool for the job. The fourth and final pop-up panel provides access to a 32-step arpeggiator with a small number of simple-but-effective controls. As for effects, every interface has its own FX Rack page containing a reverb, delay, EQ, compressor and modulator (with flanger, chorus and phaser options), plus a distortion/overdrive processor and amp and cabinet simulators. In other words, there is plenty of scope for pushing the basic patches into sound-design territory. When trying to describe the basic sound of the bells, words like dark, mellow and resonant spring to mind. Naturally the finger strikes are far softer than the mallet ones, but even the mallet strikes don’t clang or ring out harshly, and probably wouldn’t upset a migraine-suffering Quasimodo. The bells’ timbre is certainly easier on the ear than that of church or cow bells, for example, and that makes them useable as melodic elements. In summing up. 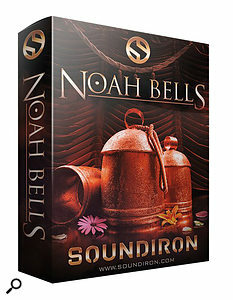 I think, it’s fair to say that Noah Bells is quite a bit more than just a library of Indian bell sounds. Sound designers might well turn to it if they have to write a score with a kind of rural mid-Asian feel, but it could also be used for atmospheric creations of a more general nature, and even find it’s way into a commercial track or two.